Nudo, in Italian, means 'naked.' 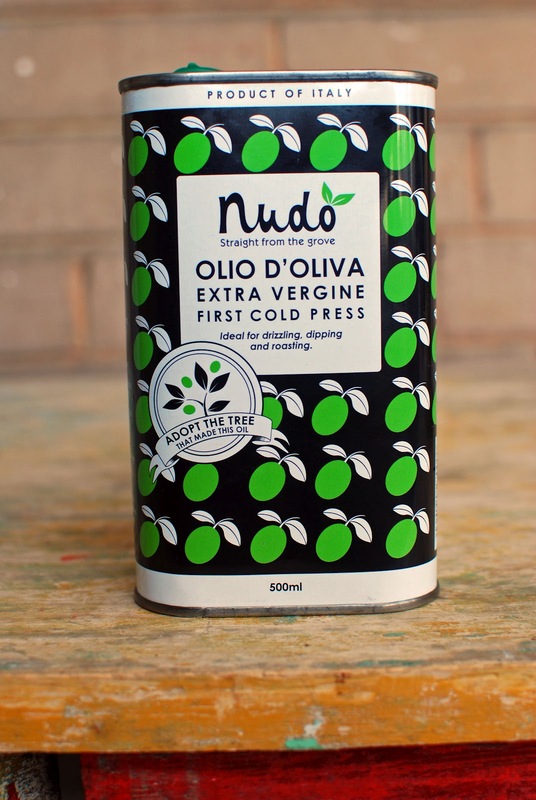 Nudo olive oil - in any language - means making what is naked taste amazing: pasta, bread, grilled vegetables, your lover... even your dessert! 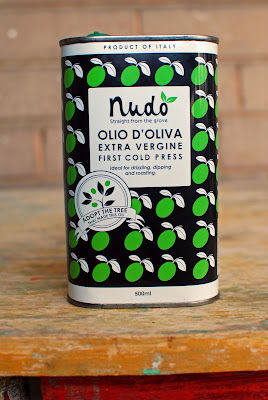 This past week I had the opportunity to meet Jason Gibb, the co-founder of Nudo: a unique olive oil company where the olive trees are adopted and the yield of each tree is delivered to the adoptive 'parent's' doorstep. I was invited to attend a tasting hosted by the lovely ladies at The Siren Group at All the Best Fine Foods - a welcoming pantry of a store, stocked with the kind of fresh food, baked goods and delightful foodstuffs that satisfy any culinary fantasy. I thoroughly enjoyed bonding over food with the owner, Jane Rodmell, whom I was delighted to find is a true culinary kindred spirit. Everything about the event was inspiring: the atmosphere, the people, the food! There were small bites highlighting each oil (it comes in natural, lemon, basil, garlic, and Sicilian chili versions) prepared expertly and with love by Executive Chef Nicole Rumball. The oil was delicious on its own, too, seducing my bread into lingering a little longer with each dip. It was a pleasure to chat with Jason and observe how passionate he is about his product. Aside from the brilliance of the adopt-a-tree idea, I was moved by the story of how Nudo came to be. Jason and his partner Cathy (both originally from the UK) were top television producers in L.A.. They produced the popular reality TV shows Junkyard Wars (a show about engineers designing and building machines using only what they find in a landfill), and Wifeswap. Producing reality tv lacked any real contribution to society, so the couple asked themselves what they could do, in their own small way, to create something worthwhile that would give back. Food being a major part of their life together, it did not seem so far-fetched to them to turn their passion for copious amounts of olive oil into a livelihood. They are, I've read, the couple that once bought a dented 25 Litre container of a favourite Uruguayan olive oil from a specialty store on a whim. In reality, however, the idea seemed about as far-fetched as the premise for most reality shows - neither had farmed, lived in the country, learned Italian, or grown much more than a houseplant. The couple quit working on a show about making something-out-of-nothing to do just that - they bought a 21 acre abandoned olive grove in Italy's Le Marche region and set about creating Nudo from the ground up. (Check out their excellent and delightfully witty book The Dolce Vita Diaries for the full story). With passionate persistence and an intense intimacy with the Italian-English dictionary, the couple navigated the ups and downs of their new life. They negotiated unorthodox real-estate rituals (one of which involved the possible matchmaking of their infant daughter to the local policeman's son). They took pruning lessons, and braved inclement weather. They survived being a small business fish in a pond full of big-business sharks. All trials were made worth it, according to Jason, when he took that first sip of his own olive oil. He described the olive pressing process as a parade of proud parents, each grove owner proclaiming his or her oil is the best; the most delicious; the nonpareil of oils. This does not surprise me, as any creative effort that one has tended with one's body, heart and soul yields such a sincere satisfaction - one learns that what one has given, one has been gifted in return. I also felt like a proud parent in the creation of this dessert: a sweet focaccia subtly highlighting the fruity, nuanced flavour of Nudo's oil, topped with a homemade ice cream that fully showcases the oil's multiple layers of flavour. 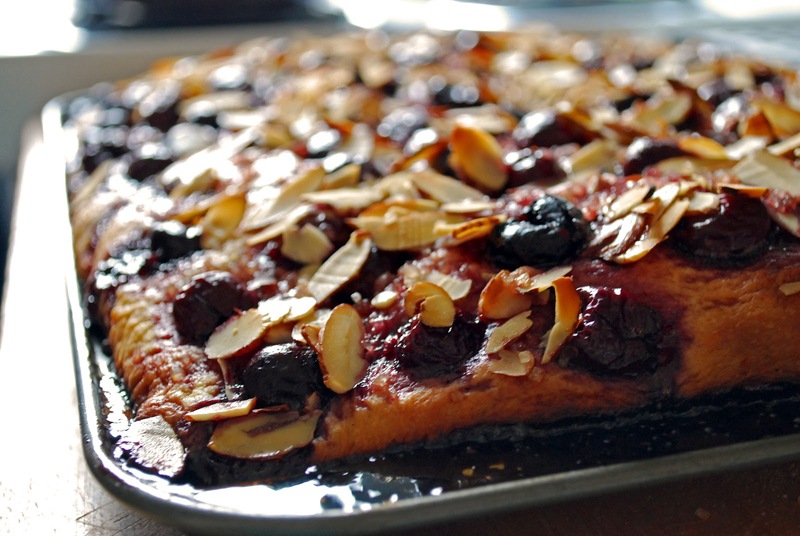 For the focaccia, a soft, yeasty, pillowy dough is dimpled with cherries and sprinkled liberally with sliced almonds and raw sugar. A reduction of the cherry syrup and a few tablespoons of Nudo olive oil are drizzled on top to languidly pool in the hollows of the dough. 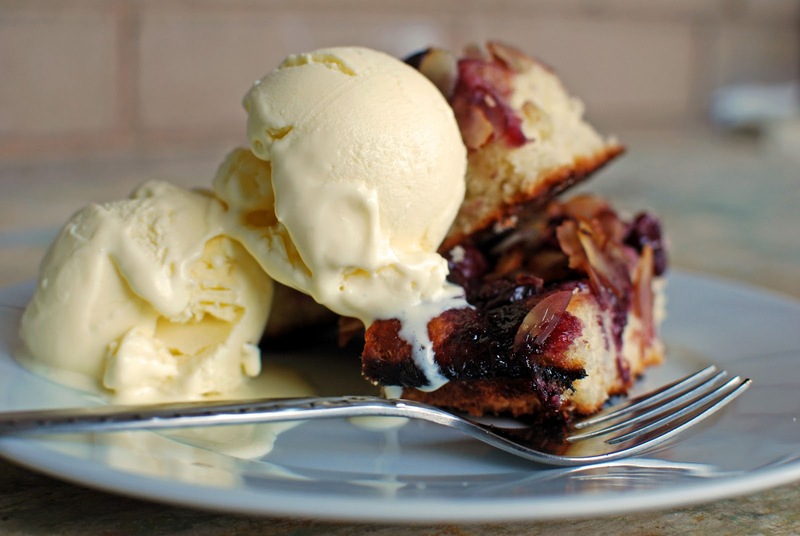 The ultimate topping, though, is a homemade ice cream made with Nudo olive oil. This ranks as one of the best ice creams I've ever tasted: layers of flavour build with each bite and the texture is unbelievably creamy and smooth. I am brand-new to the adventure of ice cream making, having just invested in the attachment for my stand mixer. I was so excited to try the multitude of flavour combinations possible, but now I would be happy to make nothing other than this olive oil flavour forever! The combination of the fruity focaccia and the silky smooth ice cream makes for a really sensual dessert - even if the only thing naked is your olive oil. In a small saucepan, warm milk to 110-115 degrees. Stir in 1 tablespoon sugar and sprinkle yeast on top, whisking to blend. Allow to rest about 5 minutes, or until yeast has bloomed (is foamy). Add eggs and whisk until smooth. In the bowl of a stand mixer fitted with the dough hook attachment, combine remaining sugar, flour, and salt. Pour in milk mixture and combine on medium speed. Feed the dough individual pieces of butter, allowing each piece to incorporating fully after each addition. Once all the butter is incorporated, knead on medium-high speed until the dough is silky and soft, with a slight sheen. Brush a bowl with melted butter and place dough in bowl, brushing the top with butter as well. Cover, and let rise until doubled in size (about 1 1/2 hours). Punch down dough. Press dough evenly into a large buttered cookie sheet, leaving a 1" border. Loosely cover and let rise until puffy (but not doubled) - approximately 45-50 minutes. In a small saucepan, bring cherry syrup and sugar to a boil. Reduce heat and let simmer until slightly thickened and reduced to 1/3 of a cup. Set aside to cool. Using your fingertips, press dimples into the dough and drizzle with olive oil. Scatter cherries across the surface, pressing gently into the dough. Drizzle the syrup over the cherries, letting it pool in the nooks and crannies of the dough. Liberally sprinkle almonds and raw sugar on top and let rise for an additional 15-20 minutes. Bake in a 400F oven until golden brown, approximately 20-25 minutes. Let cool on pan for at least 15 minutes before serving warm, or at room temperature. In a medium-sized bowl, pour in heavy cream and set a fine mesh strainer on top of the bowl. Set aside. In a saucepan, warm milk, sugar and salt until warm and steamy. In another bowl, whisk egg yolks. Slowly add warm milk into yolks, whisking constantly to temper them. Add custard mixture back into saucepan and stir on medium heat until mixture coats the back of the spoon or a candy thermometer reads 180 F.
Remove from heat and strain through sieve into cream mixture. Whisk mixture until cool over an ice bath. Cover and let sit to cool in fridge for a few hours. Once cool, follow the instructions that come with your ice cream maker. Enjoy! Your desserts are just amazing. I enjoyed reading the story behind the naked olive oil and loved how you incorporated the oil into both the focaccia and the ice cream. I've never had olive oil ice cream (I've only had it in savory contexts) but after reading this I want to try it! I can't recommend the olive oil ice cream enough - it is SO GOOD. Mmmm, a heavenly combination and a great story too. I clicked on someone's blog, then to another, then to another, until I was finally here! Delicious blog you have here! I have to catch up. 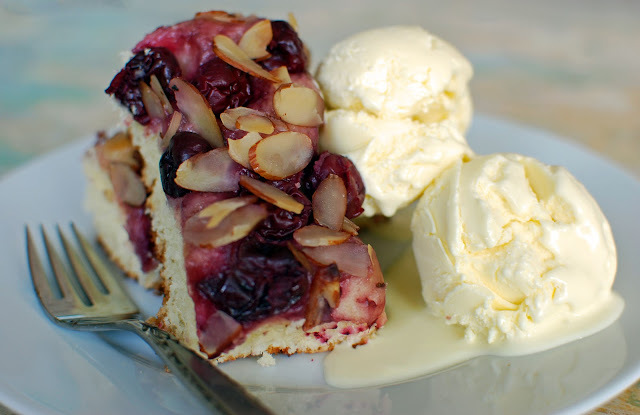 BTW, cherry and almonds...irresistible combo! Love this! 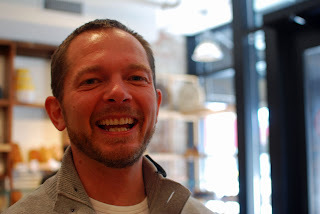 So glad your blog meandering lead you here, Jen - welcome!